A virtual treasure trove of relics, ruins and the roots of modern civilization, and set at the crossroads of Europe and Asia, Turkey is an open-air museum of an array of civilizations, religions, and great empires. Explore Istanbul, vibrant and compelling, with splendid palaces, magnificent mosaics, and grand bazaars. Watch nature flaunt its finest as you cruise aboard a tradition Turkish gullet, sailing along the sparkling clear coastal Aegean waters near Bodrum. Travel through Kusadasai, Ephesus and Izmir, investigating churches, museums, palaces and the archeological sites of the Roman, Byzantine and Ottoman empires. Explore the limestone-dotted expanse of Cappadocia - tufa stone molded into an astounding landscape of cone-shaped monoliths, and amazing fairy chimneys formed from boulders of hard basalt. Discover the intricate underground city of Kaymakli, and stay in a luxury cave museum hotel. Upon arrival you will be escorted to your luxury hotel. 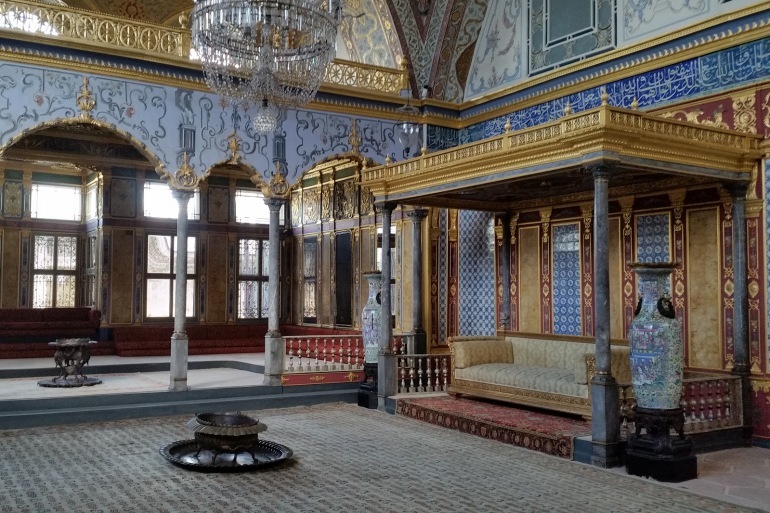 On Day 2 explore the Topkapi Palace, Hagia Sophia, Hippodrome Square and the Blue Mosque. Enjoy a traditional Turkish dinner with spectacular views. On Day 3 enjoy a private cruise on the Bosphorus and explore the Grand Bazaar. Fly to the resort city of Bodrum on the shores of the Aegean Sea. Visit Bodrum Castle, the Mausoleum of King Mausolus and the Museum of Underwater Archaeology. On Day 5 embark on a private sailing experience in a gulet, a typical wooden sailing boat from the region. Enjoy a delicious lunch served on board. Drive along the scenic coastline, stopping first at the Temple of Apollo at Didyma. Next visit Miletus, the center of Classical Hellenistic civilization, and Priene, the site of precious ruins dating back to Hellenistic period. Discover the glorious past of Ephesus, the world’s best preserved Roman city. Next, travel to Izmir and fly to Kayseri to spend the next two nights in a luxurious cave hotel in Cappadocia. On Day 8 experience an early morning hot-air balloon flight over Cappadocia’s lunar-like landscape, offering a bird’s-eye view of the “fairy chimneys.” Afterward, visit the Monastic Center of Göreme and walk through the valleys of Zelve. Visit the famous pottery- producing town of Avanos. This evening enjoy a mesmerizing presentation by the mystical Whirling Dervishes. This morning, tour the Gumusluk Monastery, then descend below the earth’s surface into the Kaymakli Underground City. Mid-afternoon, fly to Istanbul for one last night of exploring. On Day 10 you will be transferred to the airport for your flight home or on to your next destination. Located at the crossroads of two continents, Europe and Asia, The Ritz-Carlton, Istanbul is a practice in culture, hospitality and luxury. Featuring exceptional accommodations, world-class cuisine, a nurturing spa and impeccable service, this Istanbul luxury hotel's amenities and services provide an unforgettable retreat in the heart of one of the world's most fascinating cities. The Ritz-Carlton, Istanbul hotel in Taksim Square stands in the center of this fascinating, flavorful city, epitomizing its welcoming spirit and the harmonic convergence between East and West, and past and present. Bathed in Ottoman-inspired splendor that pays homage to the rich historical traditions of Turkey, this stunning Bosphorus hotel features 244 well-appointed guest rooms, including 23 suites and 57 Ritz-Carlton Club Level rooms, exceptional restaurant and bars offering delectable experiences, Laveda Spa featuring indoor pool, sauna, steam room, Jacuzzi, authentic Turkish Hamam, fitness center and nine treatment rooms including two Couple Suites as well as outdoor Spa during summer months. Nestled on the bluffs overlooking pristine Barbaros Bay, the 173-room Kempinski Hotel has a secluded private beach on one of the most magnificent bays in the Aegean is lapped by pure, crystal blue waters. A plethora of water sports and activities are available including catamaran sailing, water skiing, hiking, volleyball, and yoga. There is also a full-service spa, fitness center, indoor pool, hair salon, library, convenience stores, business center and laundry services. There are two full services restaurants, plus a pasta bar, beach grill, poolside dining and two bars. Travcoa has reserved Deluxe Sea View rooms, all with Aegean Sea views from your terrace or balcony. All rooms are air-conditioned, and equipped with satellite TV, a minibar, in-room safe, a hairdryer and free wireless internet. The Korumar Hotel has a superb location, where guests witness the most incredibly beautiful sunsets. Commanding the most beautiful sea views and presenting the highest level of style, the Korumar Hotel offers an unforgettable holiday to guests of all ages. The Korumar Hotel holds the highest standards for deluxe accommodation and a wide range of modern facilities offer guests a wide array of options. Enjoy the warm climate, beautiful sea, and close proximity to historical locations. Museum Hotel of which restoration was initiated by Omer Tosun, the chairman of Indigo Tourism, became operational after inaugurated by Erkan Mumcu, the tourism minister then, in 2002. Museum Hotel, established in a beautiful area of Uchisar, came into existence after the restoration of old ruins, paying utmost attention to the preservation of their originality. Due to its unique location all the rooms, restaurant and terraces overlook the unique panorama of Cappadocia. The Museum Hotel which has aimed to serve its distinguished guests in the best way is the sole preference of the majority of prominent guests visiting Cappadocia. Because of incomparable location, all rooms, restaurant and terraces have a grand view of amazing Cappadocia, Avanos, Goreme, Guvercinlik Vadisi (Pigeon Valley) and Kizil Vadi (Red Valley), the important sights of Cappadocia which can be viewed from above. From the beginning, Museum Hotel has provided the best special services to its guests and is the choice hotel for guests in Cappadocia. Today, all the rooms, restaurant, reception office and exterior areas of the Museum Hotel are decorated with various valuable antiquities registered at the Museum of Nevsehir. Visit this one-of-a-kind luxury hotel retreat in Istanbul's oldest district. Travel in time with visits to the 6th-century St.Sophia, the 15th-century Topkapi Palace and the 17th-century Blue Mosque, just a five-minute walk from our Sultanahmet luxury hotel in Istanbul's Old City. With 65 luxury rooms and suites surrounding a manicured courtyard and a fragrant herb garden, Four Seasons Hotel Istanbul at Sultanahmet provides an intimate enclave in the heart of the city. Each luxury room is designed around the building's unique architecture, and amenities are plentiful, including a refrigerated private bar, large plasma television, MP3 player docking station and a DVD and CD player. The lavish marble bathroom includes a deep soaking tub and separate shower - a perfect way to end the day. Travcoa will only reimburse according to our cancellation policy.